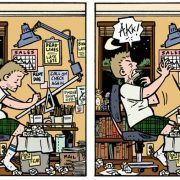 Drawing comics for a living isn't all fun and games, says Evan Dorkin. Especially when you're living with chronic pain. How K.C. Mitchell, a combat-wounded Army veteran, became the strongest amputee powerlifter in the world.